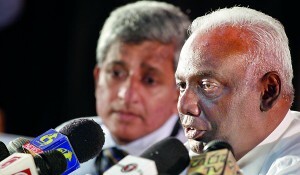 The newly elected Sri Lanka Cricket executive committee will meet for the first time on Tuesday. The secretary of Sri Lanka Cricket Nishantha Ranatunga speaking to the Sunday Times said “This committee has been elected for two years and we have a huge workload ahead of us. However as there are a lot of newcomers in the executive committee, we still have not formed an agenda”. Ranatunga said that at the first meeting the acting Chief Executive Officer of SLC, Ashley de Silva will make a presentation to the chair and the committee of what they have accomplished so far and what work is ahead of them. “From that point onwards the committee will take over. The priority will be given to the pending TV deal, where we have received the recommendations of the technical evaluation committee and Treasurer Nuski Mohammed will appraise the forum on that. In the sponsorship deal we already have singed up Dialog as one title sponsor and now we have to complete the deal by signing up the Tea Board as the co-sponsor.” Ranatunga added. Last week the Sunday Times revealed that the SLC had made their decision to go ahead with the incumbent TV provider Ten Sports and they were hoping to re-negotiate the deal which will be valid for the next seven years. Sri Lanka Cricket source confirmed last week that its Executive Committee considered an offer by the current rights holder for a sum of US$ 60 million, approximately Rs. 7.5 billion. However the figure quoted by the Dubai-based TV giant is less than half of what it offered in 2009 for a four-year period. In 2009 Ten Sports parted with US$ 65 million for the four-year period which ended on March 31, 2013. Sri Lanka Cricket earlier clinched its biggest local deal in cricket history with telecom service provider Dialog and the Sri Lanka Tea Board joining hands for a three-year deal, which will bring them a sum of Rs. 1300 million. During the next three years, Dialog will get precedence during the Lankan team’s local engagements with its logo being displayed on the chest area of playing kits, while the Tea Board logo will be rest on the shoulder region. While playing abroad the two logos will change places. Initially, mobile phone operator Dialog Axiata made the highest bid at Rs. 1.077 billion (US$ 8.5 million), while the Sri Lanka Tea Board came up with an offer of approximately Rs. 850 million. When asked why the important Provincial 4-day tournament was cancelled the SLC secretary explained that in the short term context the Lankan team will be heavily involved with the shorter version of the game internationally and as a prelude they would be paying a lot of emphasis on the shorter game even locally. Besides that he also said that the local coaching staff had pointed out that the players have been involved with too much cricket in the recent past and now they need a section of these players for intensive training which is also an important segment in their cricket.